Overview - First you're hot, then you're not...and then you're Alex Fletcher (HUGH GRANT). So when the sizzlingest tween-queen on the charts asks the has-been '80s pop sensation to write her a song, he grabs for another chance at stardom. Problem: Alex can say it with music, but he sure can't say it with words. Enter Sophie Fisher (DREW BARRYMORE), his beguiling if quirky plant lady, who has a green thumb for lyrics. Together, they go after songwriting success -- and discover that if you want to write the perfect love song, it helps to fall in love. 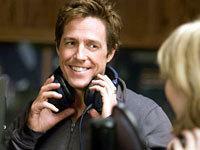 With Hugh Grant and Drew Barrymore at the keyboard and Marc Lawrence (Two Weeks Notice) directing, Music and Lyrics is a witty, wacky romantic comedy that faces the music...and laughs! In the current pop culture climate, there are at least three forces impervious to all but a nuclear holocaust: the bubbly charm of Drew Barrymore, the bubbly charm of Hugh Grant, and the bubbly charm of '80s synth-pop nostalgia. Apparently the makers of 'Music and Lyrics' figured that by combining all three in a single movie, the bubbly charm-o-meter would go through the roof, and box office receipts would follow in suit. Turns out, their formula proved half-right. 'Music and Lyrics' is indeed quite the charming, and easily one of the better "chick flicks" of the past few years. But, surprisingly, it failed to make much of a dent in theaters -- its domestic gross was a meager (by Barrymore-Grant standards) $40-odd million, and even only months later as it makes its video debut, it appears the film may already have been forgotten. The story is perfect romantic comedy high-concept. Meet Alex Fletcher (Grant), former lead singer of the one-time '80s sensation PoP!, now stuck performing for middle-aged soccer moms at summer carnivals. But when one of today's hottest new teen-pop sensations Cora Corman (Haley Bennet) asks Alex to create a song for her, he sees his chance to re-emerge into pop superstardom. The problem is that while Alex still has a knack for composing, he's at a total loss for coming up with the words. Enter his beguiling if quirky plant lady Sophie (Barrymore) who, on the surface, appears to be as tone-deaf as Britney Spears. But as Alex will discover (in a classic chick flick "a-ha!" moment), Sophie miraculously has a green thumb for lyrics. Together, this unlikely pair will embark on the path to songwriting success -- and, needless to say, fall in love in the process. 'Music and Lyrics' also scores by parodying today's hit-obsessed pop music culture with acerbic accuracy. Bennet's stand-up-and-take-notice turn as Cora perfectly channels teen pop-stardom to hilarious effect -- her ridiculous songs "Entering Bootytown" and "Buddha's Delight" are priceless -- while the faux '80s-era PoP! music video material (featuring a shaggy-haired Grant) perfectly recalls the glory days of early MTV. Even the film's centerpiece -- the fake hit "PoP! Goes My Heart" -- is credible and catchy enough that it could have been a real top ten hit back in the '80s. In the end, 'Music and Lyrics' probably has about as much resonance and staying power as a cheesy '80s power ballad. But sometimes, we just want to forget our troubles for 90 minutes, and believe in the idealized world of a movie that assures us that love can indeed be reduced to the simplicity of the sweetest, most throwaway song lyric. With the star power of Barrymore and Grant, and its sharp pointed pop culture parodies, 'Music and Lyrics' is almost a perfect cinematic pastry puff. Since I used up my quota of the words "bubbly" and "charming" in the last section, I'll have to resort to calling this transfer "bright" and "cheerful." This 1.85:1 widescreen 1080p/VC-1 encode (both the Blu-ray and HD DVD versions are identical) delivers the goods, with a very appealing, detailed appearance that's perfect for a romantic comedy. Colors are the most striking aspect of 'Music and Lyrics.' The film delivers almost too much in the saturation department, but hues remain just one millimeter on the right side of stable. Contrast also has, well, plenty PoP!, with only some slight blooming to distract. Detail is impressive, with the image usually boasting strong depth and fine shadow delineation. The source is also in immaculate shape, as is to be expected -- you'll find no print blemishes, inconsistent grain or compression artifacts here. Unlike the video, the audio for 'Music and Lyrics' is just average. Warner offers up identical 640kbps Dolby Digital 5.1 surround mixes on the Blu-ray and the HD DVD (with the latter simply receiving the tacked-on "Plus" designator), but the film suffers from typical romantic comedy-itis, meaning there is little surround fizz here to go along with the pop music beat. The mix is too front heavy, even for a film laced with so much music. I would have liked to have heard better direction of the tunes to the rears, but instead all we get is some stereo separation and lots of dialogue in the center channel. Bottom line, though, tech specs are up to snuff. Low bass is punchy and tight, while there is a nice sense of spacious and spread to the upper ranges. Volume levels are also well done, with no compensation needed to boost dialogue. 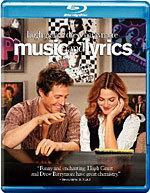 Still, like most romantic comedies, 'Music and Lyrics' is hardly a memorable soundtrack. Matching the standard-def DVD supplement-for-supplement, the Blu-ray and HD DVD versions boast the exact same collection of extras. Alas, it's a slim package, and feels rushed. No commentary is included, so it is up to the 13-minute promotional featurette "Note for Note: The Making of 'Music and Lyrics'" to pick up the slack. Unfortunately, it is just another extended commercial for the film we've just seen, with the cast and crew simply rehashing the plot along with plenty of inter-cut film clips. The seven Deleted Scenes are not much better. Totaling about 11 minutes, most are just scene extensions or jokes that are kinda flat. Only a beefed-up role for Alex Fletcher's doorman (nicely played by Daniel Stewart Sherman) offers a nice little pay-off that's not in the movie. Finally, we get a four-minute Gag Reel that's somewhat amusing (apparently, anything anybody ever says makes Barrymore giggle uncontrollably), plus the faux-music video for "Pop! Goes My Heart" in its entirety. Sadly, there's no Theatrical Trailer included. Also, none of the above video-based extras are presented in full high-def -- only 480p/i/MPEG-2 video. 'Music and Lyrics' is a nifty little date movie, but nothing more than that. Drew Barrymore and Hugh Grant light up what is a pretty contrived concept, and the pop music parodies are quite amusing. Warner has delivered perhaps the best Blu-ray that could be expected for such an inconsequential movie. The transfer is very attractive, and the soundtrack is fine. I personally would have liked a few more extras, but don't let that stop you from at least giving this one a look. 'Music and Lyrics' may not be art, but it's just about the perfect date movie for these nostalgia-obsessed, 'American Idol'-crazed times.